Saracens chairman Nigel Wray believes Premiership referees should be employed by the competition's clubs, rather than the Rugby Football Union. 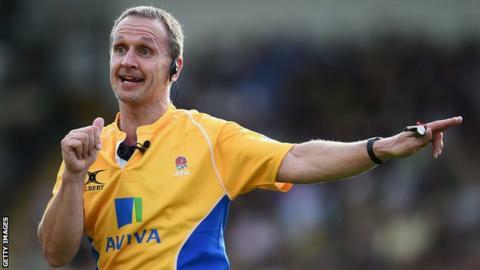 Wray says he is not questioning the quality of the RFU's referees but believes the same officials, employed by the Premiership's 12 clubs, would be able to help deliver a more appealing product. He added spectators can be put off by complicated rules, particularly around the scrum. "Rugby will only get bigger and grow if people understand what's happening," he said. "If we confuse them, don't expect them to turn up. "At the end of the day, we're in the entertainment business. We're trying to get the audience who have not yet come - if they don't have a clue about any of the decisions, how are we going to persuade them to watch?" Premiership officials are appointed from the RFU's Professional Referee Unit, which is the highest level referees can reach after coming through the regional game. "They can be the same referees, but we need to employ them," Wray said. "During the week the referees could go into schools, teach, encourage other referees and become full pros."